The Yukon Hotel is our other Dawson City hotel property and is a great choice for business travelers or others who need to stay more than a few days in town. 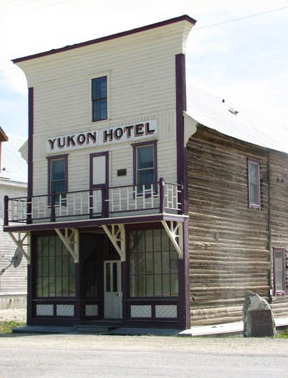 The Yukon Hotel is conveniently located on the corner of Front Street and Church Street overlooking the Yukon River. This historic boutique hotel property offers six well appointed guest suites which have been recently renovated. 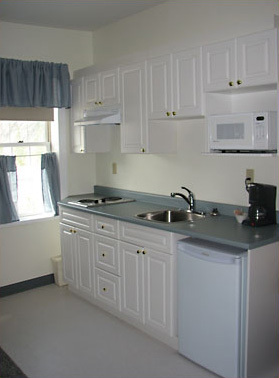 Each unit features a double or queen bed, small table and two chairs along with a full kitchen with two burner stove, small fridge, microwave, coffee maker and assorted dishes. The decor is tasteful and modern. Telephone access is hooked up through the main switchboard at the Eldorado Hotel and has voice mail. Guests have access to a coin operated washer/dryer located on the first floor of the Yukon Hotel along with iron/ironing board. Wireless internet is available in the main building of the Eldorado Hotel and we have a computer located in the lobby that is complimentary for registered guests. The log and false front building was constructed in 1898 by J.E. Binet. He named the building the Binet Block and rented the premises to Commissioner Ogilvie who used the offices for the Crown timber and land agents, the registrar of the territory and for living quarters for the department staff. In 1900 the Government Offices were relocated in the new Post Office building at King and Third Street. The Binet Block was probably used as a residence or was vacant until it was sold to Henry Freeman in 1909, who ran the building as a hotel. Minnie Witmore renamed it the Freeman Hotel in 1913 and ran it as such until 1923. In 1933 the building was purchased by Emma Wilson who owned it until 1938. After this period the structure was known as the Miners’ Rest Hotel and it was renamed the Yukon Hotel after an earlier hotel long since disappeared. The structure was purchased by the Eldorado Hotel in 1985 and completely renovated inside during 2005/2006.